(Lancaster, Pa., March 1, 2019) - Veteran Atlantic League infielders K.C. 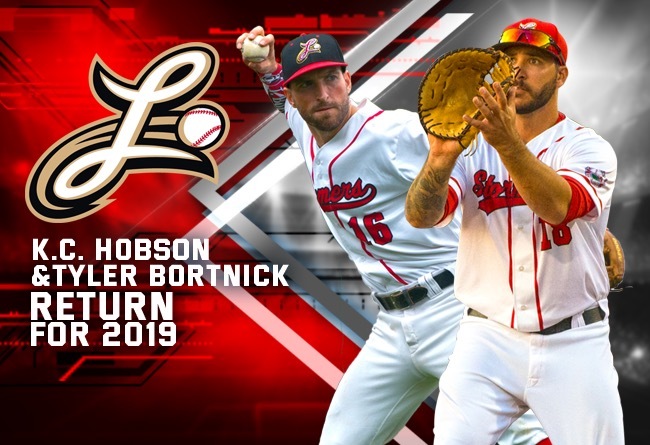 Hobson and Tyler Bortnick have been re-signed by the Lancaster Barnstormers for the 2019 season, it was announced today by manager Ross Peeples. The signings bring the total number of players under contract for the season to 13. Hobson, 28, will be back for his fourth tour of duty with Lancaster. The slugging first baseman initially joined the Barnstormers in June, 2016 and hit .320 with 24 home runs, amassing a .570 slugging percentage over that time. Following a look with the Chicago White Sox in the spring of 2017, Hobson returned to the Barnstormers and hit .326 with 21 homers and 61 RBI. His contract was purchased by the San Francisco Giants in late June, and Hobson remained with Class AA Richmond until early June 2018. The lefty batter returned to the ‘Stormers and, after a slow start, recovered to bat .244 with 10 homers and 46 RBI. He hit .369 in his final 26 games of the season. The former Toronto farmhand ranks as the fifth leading home run hitter in franchise history with 55. He will open the 2019 season within six long balls of the second spot. Bortnick, 31, will be in his third stint with Lancaster and fourth in the league. The right-handed batting infielder is coming off an unusual season in which he excelled at everything except hitting for average. The Ohio native drew 67 walks, good for fourth in the league, and was hit by a pitch 17 times, tying a franchise record. He stole 24 bases of Lancaster’s club record 256 and played stellar defense at both second and third base. His offensive highlight of the year was a grand slam off Sugar Land’s Dan Runzler which brought the ‘Stormers a key 8-6 victory during the first half stretch drive which ultimately came up short. Overall, he hit .199 with six homers and 43 RBI. In his first tour with the Barnstormers, the one-time Arizona prospect batted .280 in 52 games in 2015 before the Seattle Mariners purchased his contract in June. Bortnick also hit .273 in 71 games for the Somerset Patriots in the 2017 season around his contract being purchased by Milwaukee. He has spent all or part of five seasons at the Class AAA level.